Detectives Afridi and Misbah have been sent on a dangerous mission in their country's hour of need and are wandering through an unknown jungle location. Afridi: What time is it now? Misbah: About two minutes after you last asked me. 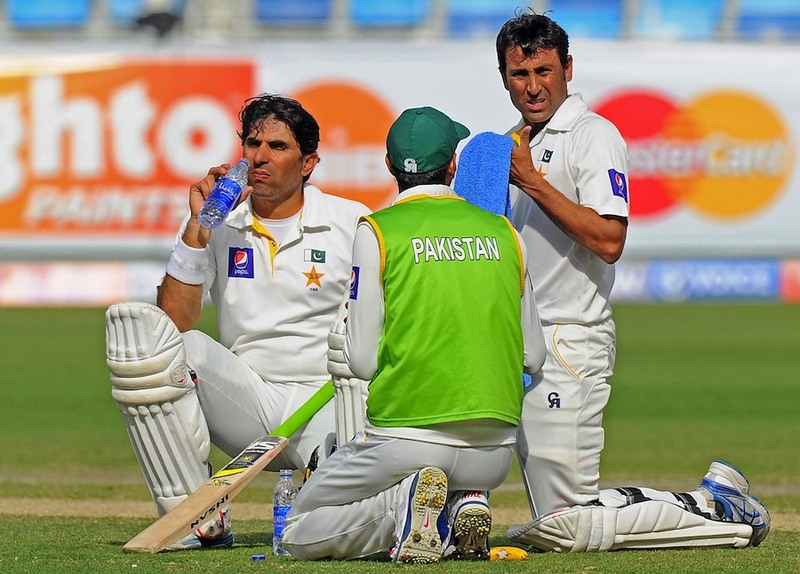 Misbah: You will get your official PCB water biscuit ration at 08:15 hours and not a second sooner, Detective Afridi. Wait, what's that noise? Misbah: No, that other noise. They find themselves on the edge of a jungle clearing. Ahead of them is an old abandoned shack from which a suspicious humming noise emanates. Misbah: I think this place might be booby-trapped. Misbah points to a sign that says "Warning: This Place May Be Booby-Trapped"
Afridi: Ah, they just put that up to scare people away. Misbah: Oh no, a bowling machine! The bowling machine bleeps and begins to fire medium-pace outswingers at them. Misbah unpacks his bat and begins to block. This goes on for some time. Afridi: I've had enough of this. Misbah: What are you doing? Afridi: I'm going to destroy the bowling machine. Afridi: With the power of the slog! Afridi takes out his bat and jumps in front of Misbah. He smashes his first ball straight up in the air. It knocks a sloth out of the tree above them which lands on his head. Afridi: Ah! I can't see! Misbah: Use the force, Detective Afridi! Afridi lashes out wildly sending cricket balls flying in all directions. Eventually he connects properly with a delivery that flies back into the bowling machine and disables it. Misbah: Seventeen miss-hits and one on target. That's about your usual average. Afridi: Well, if we'd done it your way, we'd still be here next week. They enter the hut. Inside it is dark. Suddenly they hear a low and menacing voice. Voice: Be gone intruders! You are in grave danger! Turn back while there is still time. This is your final warning… oh it's you clowns. Younis: I should have known they'd send you two. Misbah: It's been a long time, Younis. Younis: At least a fortnight. Afridi: Police Chief Waqar sends his regards. Younis: I've got nothing to say to him and I've got nothing to say to you either. Misbah: What have you been doing with yourself? Younis: I keep myself busy. Been doing a lot of needlepoint. Misbah: Needlepoint eh? How's that working out? Younis: I stabbed myself in the thumb a few times. But I'll survive. Afridi: Your country needs you, Younis. Younis: Yeah? Well, I don't need them. I told you, I'm finished with the PCB. Fourteen years in the department and what thanks do I get? Not even a certificate of long service. I'll tell you what I told Chief Waqar. I'm done with cricket. Misbah: I'll let you be vice-captain. Younis: Do I get a badge? Misbah: Yep. And the second best peg in the dressing room. Afridi: You said I could be vice-captain! Misbah: I said you could be vice-captain when you're mature enough to handle it. Misbah: Yes, well when you act like a 34-year-old, people will start to treat you like a 34-year-old. Younis: Hey, Detective Afridi, what's your batting average these days? Misbah: He's hoping to get into double figures soon. Younis and Misbah exit, laughing. Afridi: That's not fair! I'm always batting with the tail! My batting average is not a true reflection of my impact value! Are you listening to me? Can I have my biscuit? Blogs Is Tuk Tuk the new Boom Boom?